(Part II)This is the second part of the story from several days back; so if you have not seen and read Part I, then click here. The focus of this entry is to discuss techniques for catching summer run steelhead on the Willamette River up high in the Eugene / Springfield area. Previously, I mentioned fishing techniques for steelhead on the McKenzie River, and now I am going to explain the secrets to getting into steelhead on the Willamette. The Willamette River is structurally different than the McKenzie, and it flows with a velocity that varies a lot, dictating how to approach the different pieces of water. I will discuss how to crack the code on what lines to use, and how to choose the right fly patterns to hoax the steelhead into biting. 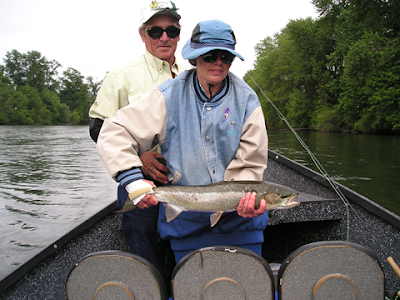 Steelhead on Tight - "Town Run"
The Willamette River in the Eugene / Springfield area can be broken up into a 3 sections. There is the section that people refer to as the "Town Run", and it is literally the water that flows right through the city limits of Eugene and Springfield. It is wide and shallow with mostly ledge bedrock tailouts after long slow "frogwater" pools. There are a few runs, but most of the water is classic steelhead tailouts, and typically fishing is done with fly lines that run shallow in the water column. Floaters, Type II or Type III sinking tips are all you need when the water levels are good for fly fishing. Flies that I use which are proven to get into plenty of steelhead are the Purple Motion Prawn, Moal Leeches, Silver Hiltons, and basic marabou patterns. The fish are very aggressive, and they will move far to strike a swung wet fly. The "Town Run" more or less runs from the confluence of the Coast Fork Willamette down through town north to the Beltline Highway crossing. Above that you have two sections that you could classify; although the techniques for fishing would be the same for both. At the top most upstream portion of water that the fish run up to is Dexter Dam, and that is the end of the road for the migratory fish (salmon and steelhead). The fish keg up below the dam, but so do the anglers at times. It can be crowded and intense out there in the early season, and fly fishers are the minority by far. On the other hand, there are plenty of times where you can slip in to water that is lacking people, but happening with steelhead numbers. Fishing for steelhead below Dexter Dam can be done with fly lines ranging from a floater through Type V, and the flies that I prefer to use are the same as the ones mentioned for the "Town Run". I do also have a few spots that I will probe flies under a strike indicator with a stonefly nymph (catered for steelhead) and a glo bug dropped off of it. Generally the Willamette is a swinging fly river, but there are a couple of hot spots that you can dead drift flies in, and you can have good success doing so. The river below Dexter Dam has some minor rapids, but enough to slow the fish up into classic steelhead water. Runs, tailouts, and pools are where you will typically target steelhead from Dexter down, and the water is loaded with back to back fishable spots. You do not have to row far downriver to come up to the next spot after you are done fishing a given location. Floating lines should be used in the shallower water (3 feet deep or less), while the sinking tips should be determined by the depth and speed of the water. A type V sinking tip may be more useful in the early season, while it may be only useful in a spot or two when the water drops down to the lowest summer level. Downstream of the Dexter Dam stretch, the water changes a little bit in the way that it flows, and the fish tend to hold in slightly different water. Below Dexter Dam, the fish tend to hold in water that is easy to read, and it is a bit more straight forward to the average fly fishing steelheader. Conversely, the water in between the "Town Run" and Dexter Dam is what I would deem as the most ambiguous for steelhead water in the area. It is one of the pieces of river where it looks good just about everywhere. The water is walking speed just about everywhere you look, and the depth is from about 18" to 5' deep just about everywhere too. 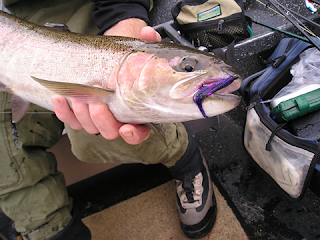 Lots of places for steelhead to hold in, but how do you know where they are at? So how do you figure out where the fish are holding in the stretch? 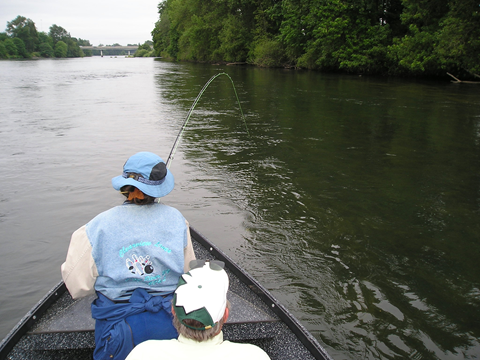 It is difficult, and I would say that if you are coming to fish the Willamette on your own, this stretch would be the hardest to figure out. It is a stretch of river where you have to pay your dues, and learn the river; since the fish are harder to find. Once you learn it; you will realize that the steelhead are creatures of habit, and they will be at the same spots day after day. Steelhead taken while learning how to cast on a fly rod - "Town Run"
The fish in the stretch in between Dexter and Town are generally running through, and not holding in the early season. Many of the fish are headed to Dexter Dam (where they were stocked before running to the ocean), or straying from the "Town Run". The river widens in this stretch, and the bottom is made up of mostly uniform sized cobbles; so there are not really large boulders breaking up the current to help with steelhead choosing their holding spots. Due to this, a lot of water that looks classic may be fish-less; while some of the hottest spots do not really look like they would be all that productive. Swinging flies tends to be the best method out there for this area, and the wide shallow river dictates to cover a lot of water. Nothing cover vast parcels of steelhead water better than swinging flies, and the fish will move far to drill your fly on this stretch of river. Flows can vary a lot on the Willamette, and there is not much of a warning from the army corp of engineers about when they are going to release water from Dexter Dam. Sometimes the river is running high for weeks; while other times it will be lower than you can imagine with exposed gravel bars all over the place. Typically lower flows are preferred, but the water can get to be too low at times for good productive fishing. When the flows are running high, it gets more difficult to figure out where to fish at, and the fish seem to really spread out and are hard to find. Water temperatures run a lot higher than the McKenzie River, and it is probably the one of the most important reasons why the fish are aggressive and will move far to strike your swung wet fly. The river runs steelhead green with good clarity, but enough murkiness to make the steelhead fearless. The McKenzie runs tap water clear and super cold; so the fish on the Willamette seem to be easier to catch, and more apt to take a swung fly on a floating line. In a nutshell, while fishing the Willamette River, you can fish with heavier flies and denser sinking lines higher up the river towards Dexter Dam; while fishing more towards the surface as you get lower down the river. The lower you go on the river the more you can use a floating line and fly that is more oriented towards to surface. On the flip side, I have skated dry flies on a floating line below Dexter Dam and I have done very well. That was a late season thing though; since in October the river can have maybe 1 person or nobody on it. ** With steelhead fly fishing you can catch fish with a variety of techniques. I have mentioned things in this blog entry that will work for someone going to fish the southern Willamette Valley area for the first time, and they are wondering what to bring how to use it. There are literally only a few steelhead fly fishing guides out on these areas I have mentioned who work out there with heavy consistency, and we all share the same spots, notes, and fishing tips with each other. We help each other with spots and how to perfect fishing them. These tips mentioned in this blog are from me, but my knowledge of these areas is from endless experience and sharing the knowledge with a couple of other successful anglers who are out there. 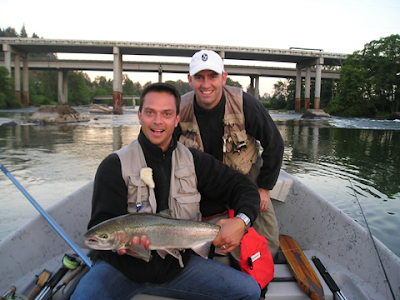 One thing that I can say about the Willamette and McKenzie Rivers are that they are VERY GOOD for summer steelhead. 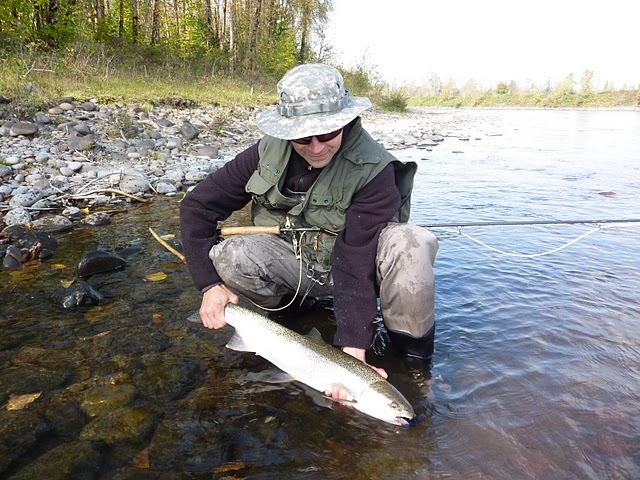 The runs come in early compared to many summer steelhead fisheries. Watching a sight fished McKenzie steelhead in the cold gin clear water eat your fly is any bit as cool as fishing in the crystal clear waters of New Zealand. 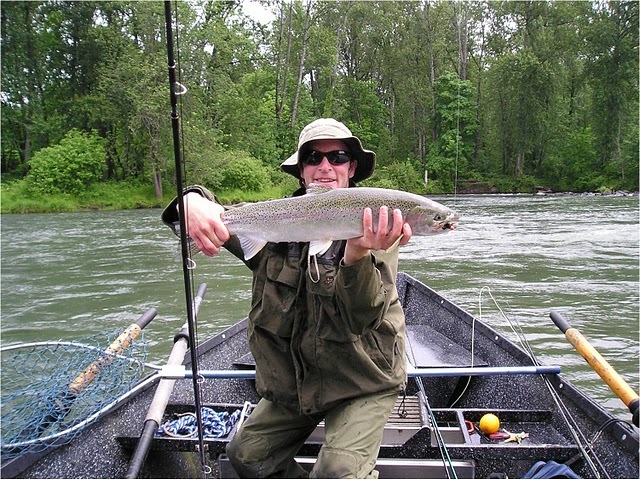 The fish in the Willamette can be as aggressive as any Deschutes steelhead or North Umpqua steelhead, and the fishing pressure can be light after the initial hype of the anadramous fish runs in the spring is over. Last fall, a statistic I can brag about was that the worst day I had on my fall guide season was one 1 fish day. That person was barely able to cast the Skagit head out of the spey rod (some people are only capable of making a super short cast), and we still managed to get into a landed fish. I hear of people getting skunked for days on end at some of the "famous" steelhead rivers like the Deschutes and North Umpqua.Otherwise the rest of the days for my fall guiding for steelhead were met with multiple fish hookups and simply GREAT STEELHEAD FLY FISHING!